Tommy Lawrence had a very brief Arsenal career making a single A team appearance in the 1956-57 season. An England amateur international he went onto transform Enfield as both a player and manager. Born 14 December 1933 in Sunderland, he was on West Ham books while scoring prolifically for Barnet during the 1955-6 season. He then joined Hendon in the summer of 1956. While at Hendon he made his one appearance for the Gunners. This was an end of season game in the London Professional Midweek League on 24 April 1957. Unfortunately it was a resounding home defeat at the hands of Tottenham by 5-0. At the start of the 1959-60 season he joined Enfield, and his 196 goals in 204 appearances for Enfield’s makes him their leading scorer. 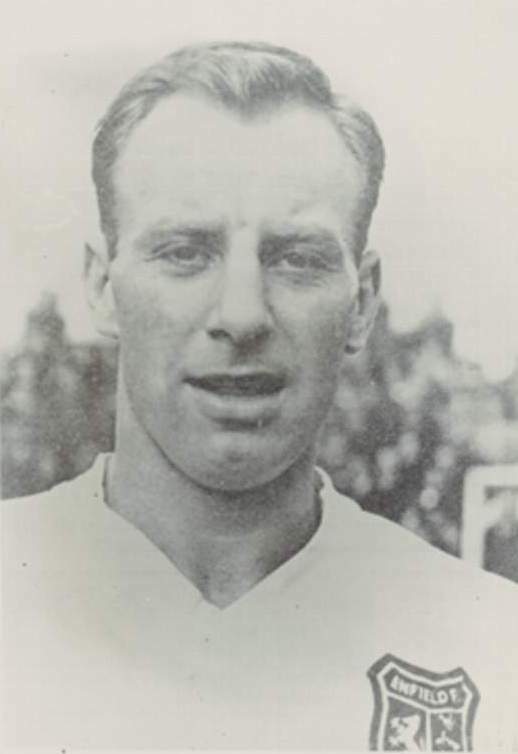 On his arrival Enfield began winning trophies and his performances lead to his selection for the England Amateur team and in twelve internationals he scored eight goals. Lawrence made three appearances in the 1964 Olympic qualifying games scoring four goals including a hat-trick against Iceland in September 1963. Years after Arsenal had spotted him he caught the attention of more Football League clubs, but turned down a Brighton offer to turn professional. Tommy’s playing career came to a premature end while in a trial game for GB against Coventry City in March 1964. During the game he clashed heads with Coventry’s George Curtis which resulted in a depressed fracture of the right temple. After an emergency operation to relieve pressure on his brain he was advised to stop playing. He returned to Enfield and was appointed manager in the summer of 1965. Under his leadership they won an impressive two FA Amateur Cups, three Isthmian League titles, one London Senior Cup and three Middlesex Senior Cups. Unsurprisingly his managerial skills were in demand and after a number of offers he went to manage Slough Town in the summer of 1970. Slough won two Athenian League titles, two Bucks & Berks Senior Cups and were runners up in the 1973 Amateur Cup final at Wembley before he returned to Enfield in 1973. Enfield football legend, Tommy Lawrence passed away on 9 October 2016.